Well kids, we are off. It has been a long time coming but we are finally leaving on our long planned three month trip. Yes, you heard it! Three months! This could truly turn into the blog that will not die, so the moment you get tired of it, just let me know. Write to me and ask to be removed from the list. But you better have a good reason – going totally blind would work, or getting a friend to write and say that you have died would also be acceptable. But rest assured if I don’t get some sort of missive from you along those lines, you will continue to receive these until you do go legally blind, or die, or both. Our trip starts with a two week stay in Bali. But first we have to get there. Not as easy as you might think. It is going to take 23 hours of travelling. We did find an alternative route that took a couple of hours less but cost thousands of dollars more. So we opted for Eva Air which goes via Taipei. This is a Taiwanese Airline and as always Taiwan does a pretty good job of producing a similar product to others, but at a much more reasonable cost. Of course it usually achieves this by paying the workers a pittance and by using less expensive materials. Neither of which sounds like a good idea when applied to the airline industry, so we are a little anxious to see how it works out. Well the first thing they did was to have the flight leave at one in the morning, a time when we would much rather be fast asleep in our beds. We arrive at the airport at 11.30 and we might as well be in a foreign country. The departure lounge is packed with Asians and they are are all making their way to the Eva check in stand. Asians, as we come to know, don’t like to queue. There is a long line of customers waiting in the usual zigzag line marked out by a series of ropes, We watch as one charming lady keeps pushing her case under the rope into the next part of the line. She then shrugs as if to say “how did that happen?” and dips below the ropes to retrieve it. Only she doesn’t – she just stays with it, so jumping in front of a dozen people. She does this a couple of times till she finds herself at the front of the line. She is all smiles and totally oblivious to the death threats being issued from the other people in line. But of course this has little to do with us, because as you might have guessed, we are not in line. That would mean traveling in the back of the plane and you know I don’t do that unless Gordon makes me. And is this is a fourteen hour flight, so Gordon has readily agreed to business class. There are two flights leaving for Taipei within half an hour of each other and we are on the second one. A young Taiwanese man checks us in at the counter. He is efficient, smartly dressed but lacking in charm. His English is limited. 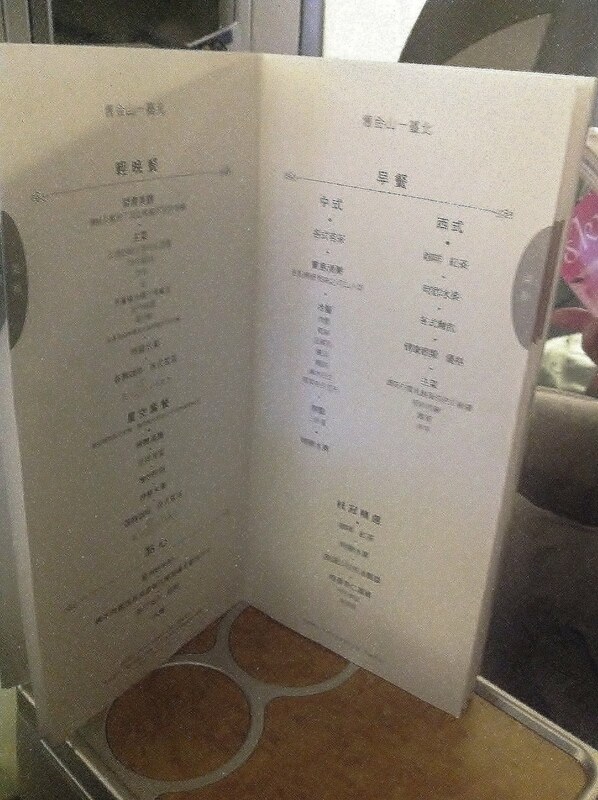 He tells us there is a business lounge where we can relax until the flight leaves. We enter the lounge and are greeted by a Taiwanese woman who says she has kept two seats for us. We think that she is joking but then we remember that Asians rarely joke. And this one wasn’t. There are two empty seats next to the toilet door and that is it. All the others are filled. The lounge is just as I imagine their country, tiny and packed with people. The room is crammed with chairs and everyone of them has an Asian person sitting in them. We appear to be the only Caucasians. In the middle of the crowded room they have somehow found space for a small round buffet table which is sparsely populated with trays containing small round pieces of unrecognisable food in alarming colors. The mens bathroom also suffers from overcrowding, mainly because there is just one urinal and one cubical. Once in the cubical it is almost impossible to sit down due to the presence of a large floor buffing machine taking up most of the space. I am not sure why it is there, but hope it isn’t wanting to do the same thing that I do. It could get messy. Taiwan may be the land of knock offs but there is one thing they can’t knock off which they have taken into their hearts. It was created in Japan almost forty years ago and while many countries might be ashamed of this particular product, most of Asia embraces it, though few countries have gone as far as Taiwan. There are planes on the tarmac painted with Hello Kitty. We breathe a huge sigh of relief when we discover ours is not one of them. 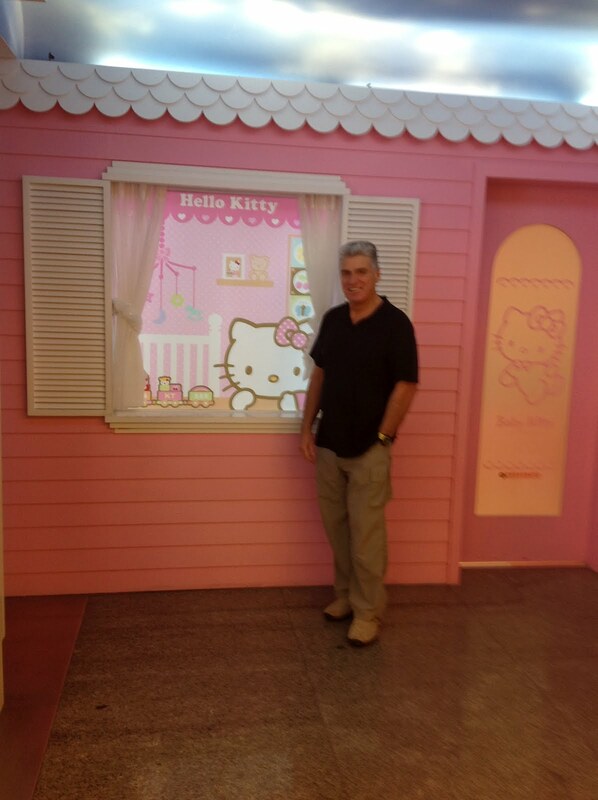 Even gay men draw the line at flying in a “Hello Kitty” plane. (Ed:Speak for yourself!) However the inside of our plane is another matter. 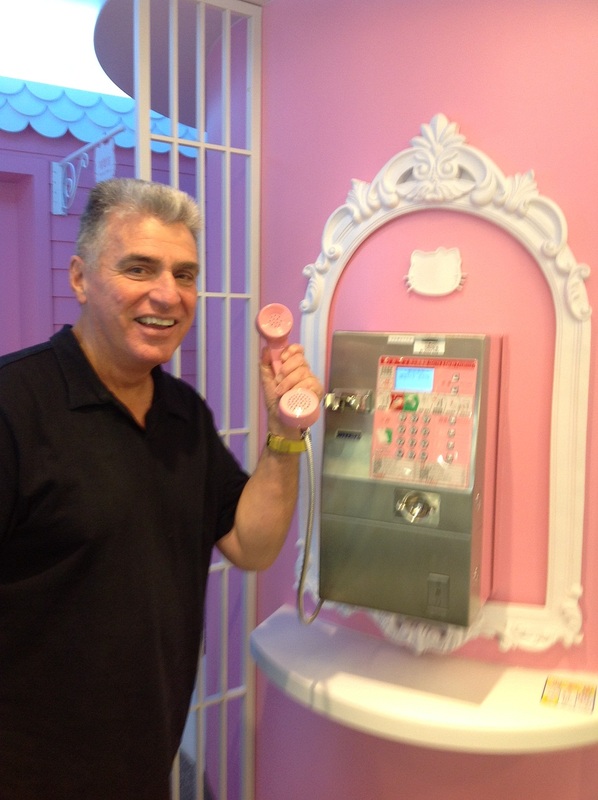 It is decorated in the Hello Kitty Color Scheme. If we were prepubescent girls (quiet in the back!) we would be loving it. For those of you whose education is severely lacking and don’t know what this means, just think of the cutest pastel colors imaginable and throw in a lot of pink and you have the inside of our plane. The seats are green and lavender, the linens yellow, the walls a dusty grey, and the stewardesses are dressed in a fetching shade of green. For meal service they don a charming pink apron. There are just 36 seats in business class and an unbelievable 8 stewardesses to look after us. Score two for Eva Air. There are no male flight attendants, they are all female. Presumably because no man is willing to be dressed like Hello Kitty. While waiting for the food to arrive we look at the duty free catalog. It is the size of a telephone directory and is filled with every type of conceivable product, and several inconceivable products, that are being knocked off in Taiwanese factories. 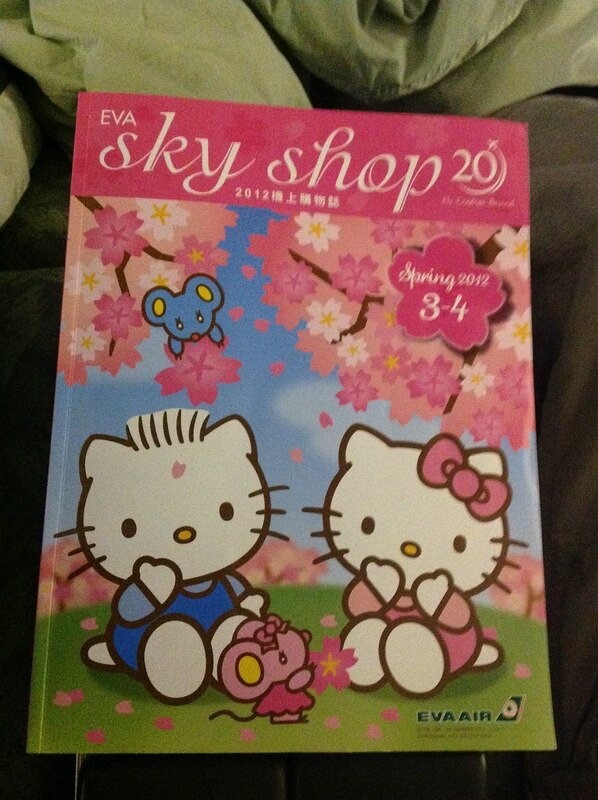 The cover of the catalog features Hello Kitty and the inside is all printed in pastel colors. But as always consumerism trumps all and we see many Taiwanese ladies leaving the plane with huge duty free shopping bags. You just never know when a box of rubber gloves will come in handy. Before we booked our flight we made sure that Eva Air offered lie flat beds, and indeed their website proclaimed that this was the case. They weren’t exactly dishonest in this claim. The seat does indeed extend into a totally flat position. However the proximity of the seats in front and behind means that the bed does not go horizontal. It stays at an alarming 45 degrees, so that when I fall asleep, my body slowly slides downwards leaving me in a rather uncomfortable position crumpled up on the foot rest. The only thing that keeps me from falling onto the floor is the seat belt that is now biting into my arm pits. Eva did however score in the bathrooms, and while that phrase could lead to many comments, I shall rise above them. The bathrooms too are in Miss Kitty greens and yellows, but what is really impressive is that they are spotlessly clean and remain that way throughout the entire trip. Teenage Taiwanese girls are everywhere, in cute little outfits, perfectly made up with their jet black hair shining. They pose in front of every Hello Kitty shrine they come across, asking strangers to take their photos with their Hello Kitty smartphones. They must take hours to cross the airport. Do they have a plane to catch or are they just there for Hello Kitty? We can’t wait to get on the next plane. Another flight, this one only five hours long, in pastel heaven, and we are descending into Bali. Suddenly the light changes inside the plane. Huge black clouds shroud the aircraft, rain lashes against the windows and lightning streaks across the distant sky. The seat belt sign flashes on, the flight attendants in their little green outfits rush for their seats. “Please remain seated. The landing might be bumpy” comes the announcement, followed by a helpful purser telling us that it is raining heavily in Bali and that the weather forecast is for storms and heavy rains for the next week. 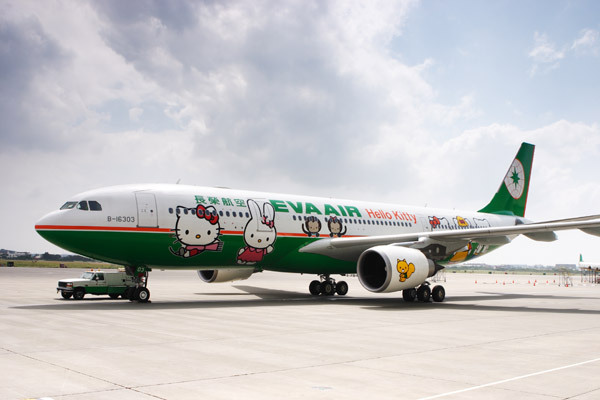 This entry was posted in Eva Airline, Hello Kitty, Taiwan. Bookmark the permalink. 3 Responses to Hello Kitty! So glad you are back, up and running and purring nicely! GreatStart to three monts of enjoyable reaqding thank you both and who ever sorted the problem out.